This example illustrates how to generate HDL code for a Digital Up-Converter (DUC). A DUC is a digital circuit which converts a digital baseband signal to a passband signal. The input baseband signal is sampled at a relatively low sampling rate, typically the digital modulation symbol rate. The baseband signal is filtered and converted to a higher sampling rate before modulating a direct digitally synthesized (DDS) carrier frequency. The input signals are passed through three filtering stages. Each stage first filters the signals with a lowpass interpolating filter and then performs a sampling rate change. The DUC in this example is a cascade of two FIR Interpolation Filters and one CIC Interpolation Filter. 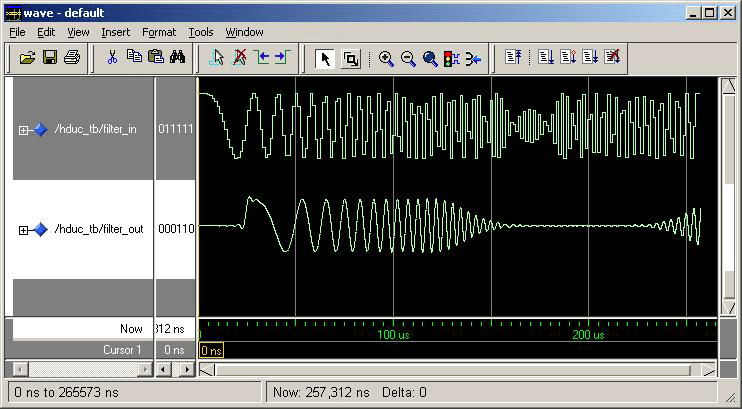 The first FIR Interpolation Filter is a pulse shaping FIR filter that increases the sampling rate by 2 and performs transmitter Nyquist pulse shaping. The second FIR Interpolation Filter is a compensation FIR filter that increases the sampling rate by 2 and compensates for the distortion of the following CIC filter. The CIC Interpolation Filter increases the sampling rate by 32. The filters are implemented in fixed-point mode. The input/output word length and fraction length are specified. The internal settings of the first two filters are specified, while the internal settings of the CIC filter are calculated automatically to preserve full precision. Create a 32-tap FIR Interpolator with interpolation factor of 2. Create an 11-tap FIR Interpolator with interpolation factor of 2. Create a 5-stage CIC Interpolator with interpolation factor of 32. Create a cascade filter including the above three filters. 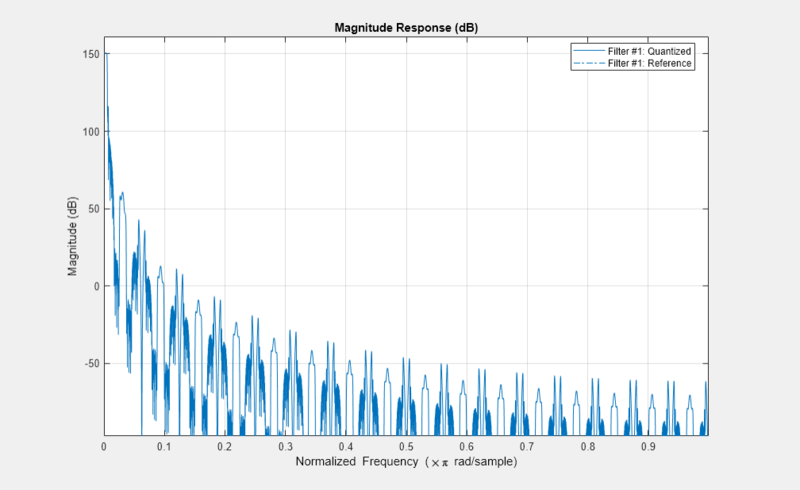 Check the frequency response of the cascade filter. Generate synthesizable and portable VHDL code for the cascade filter. You have the option of generating a VHDL, Verilog, or ModelSim® .do file test bench to verify that the HDL design matches the MATLAB® filter. To generate Verilog instead of VHDL, change the value of the property 'TargetLanguage', from 'VHDL' to 'Verilog'. Generate a stimulus signal for the filter. The length of the stimulus should be greater than the total latency of the filter. Generate a VHDL test bench to verify that the results match the MATLAB results exactly. This is done by passing another property 'GenerateHDLTestbench' and setting its value to 'on'. The stimulus to test bench is specified using the 'TestBenchUserStimulus' property. Assume 16-bit signed fixed-point input with 15 bits of fraction. ### Done generating input stimulus; length 300 samples. The following display shows the ModelSim HDL simulator running these test benches. In this example, you designed three individual interpolation filters, cascaded them into a Digital-Up Converter, verified the frequency response of the filter, and called Filter Design HDL Coder™ functions to generate VHDL code for the filter and a VHDL test bench to verify the VHDL code against its MATLAB result. The simulation result of the VHDL code proved that the generated VHDL filter produced a bit-true implementation of the MATLAB filter.